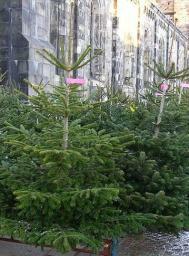 When you decide to buy a christmas tree, you have a difficult choice between the artificial fir or natural fir. This comparison table tries to detail in a objective way all the advantages and the drawbacks of artifical christmas tree and natural one. You can participate: vote for your favorite choice and comment which solution do you prefer. Cost a bit more expensive when you buy the first time but cheaper in the end, since it can be reused for several years. It can be rented already decorated from specialist dealers. The natural tree produces oxygen from carbon dioxide via photosynthesis (reduction of greenhouse effect). Local production using the local economy and reducing pollution from transport. It is biodegradable (compost, wood chips ...). Tradition, ritual purchasing choice in family ..
Made from petroleum, a non-renewable (scarcity in future years). Production processes consuming energy and emitting plastic greenhouse gas emissions. Pollution to import by air firs, mostly manufactured in Asia. They are neither recyclable nor biodegradable. If it catches fire, it emanates toxic fumes and hazardous to the environment but also for humans. You need to have space to store it all the year. Depending on the quality .. the tree loses its luster quickly and should be discarded quickly. Some growers use chemical fertilizers and other herbicides for the cultivation of trees, whose effect is harmful to the environment. It loses its thorns, so we must clean regularly around the tree. We must buy it every year. Average 3 years (to keep more than 16 years to make it more environmentally friendly than a natural tree). 1 year (or more if you buy it in the pot and succeed to replant it, which is rare ...). 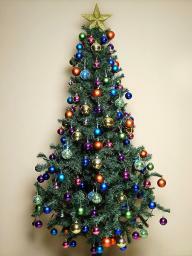 Excerpt Compare artificial vs natural christmas tree (advantages and disadvantages of both options). Ce comparatif m'a permis de comprendre que le sapin naturel était la meilleure solution (de mon point de vue).